I think it's really such a shame when I hear that someone doesn't like mushrooms. As with all other food dislikes, my theory is that mushroom-haters have had the misfortune of having a badly prepared version; those pale canned mushrooms on top of a bad takeout pizza can traumatize just about anyone. But when they're done right, mushrooms somehow are both deeply complex and humbly simple at the same time. I just can't wrap my head around what there is to not like. In this quick pasta dish, their heady aroma is easily coaxed out through the addition some of my favorite ingredients - garlic, butter, capers, lemon, and parsley. I can't really pick a favorite mushroom; that would be like picking my favorite cut of pork, or Beatles song. Different occasions call for different types; this time, I chose a mixture of white buttons and creminis, who both have the structural integrity to stand up to a good roasting. When have chunks of butter ever led to a bad thing? Pre and post the oven. You know you've done right when your mushrooms have darkened and shrunk, concentrating in flavor, and your butter has melted to make a sauce worth drinking with a spoon. But don't. We'll need it for the pasta. Brightened with that fresh zing of lemon and parsley, briny with the little bursts from the capers, and perfumed with the intoxicating combination of garlicky butter, these mushrooms can make a convert out of anyone. Get a pot of water on boil. Preheat oven to 450F with rack in the middle. Toss mushrooms with capers, garlic, oil, 1/8 teaspoons salt, and several grinds of black pepper in a shallow baking dish. 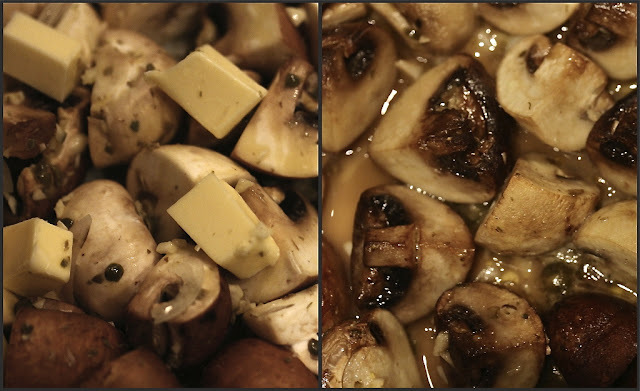 The mushrooms should fit in the dish in one layer with some space in between; crowding the pan too much will result in boiling/steaming as opposed to roasting. Top with butter and roast, stirring occasionally, until the mushrooms are tender and darkened, 15-20 minutes. While mushrooms are roasting, boil your pasta according to directions. Drain pasta and return to pot. When mushrooms are done, stir in lemon juice and parsley. Add to the pasta in pasta top, and toss to coat. Serve immediately.